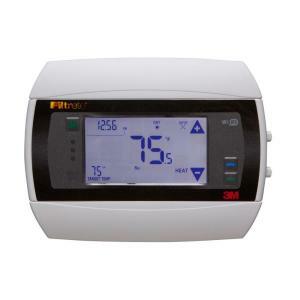 The Radio Thermostat Company CT50 has a feature many would be happy with. 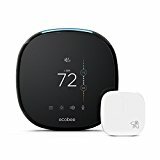 When compared to other wifi thermostats on the market, it lacks smart features such as energy usage report and smart monitoring sensors. 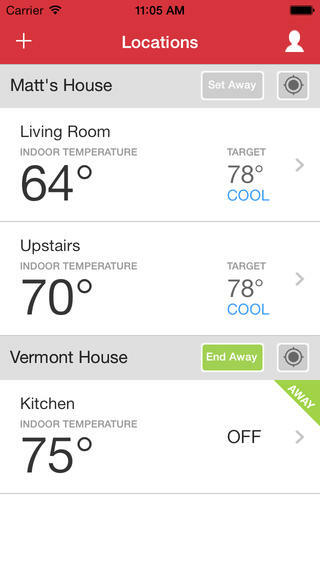 The wifi thermostat market is being taken over by smart thermostats that cost the same. My recommendation is move onto the Honeywell Wifi Thermostat. I know what you’re thinking, I don’t see the Filtrete logo anywhere! Well, the CT50e is identical to the Filtrete 3M-50. Filtrete simply paid to sell these thermostats as their own. They have actually stopped providing technical support and direct customers to Radio Thermostat Company for help. Calling a professional to install a new thermostat is the last thing on a handy homeowners mind. As the wifi and smart thermostat market evolves, simplifying the installation process is on the top of every manufacturers list. Radio Thermostat Company provided an installation guide to help with the process. Disconnecting the reconnecting the wires is a relatively bare bones step that has yet to be reimagined. What makes or breaks the install is connecting the wifi. For some reason, connecting to wifi is usually a unpleasant experience. The CT50e comes with a USNAP module. Once inserted it enables the thermostat, instructions appear on the screen to guide you through the connection process. The steps take some time but overall are easy to follow. 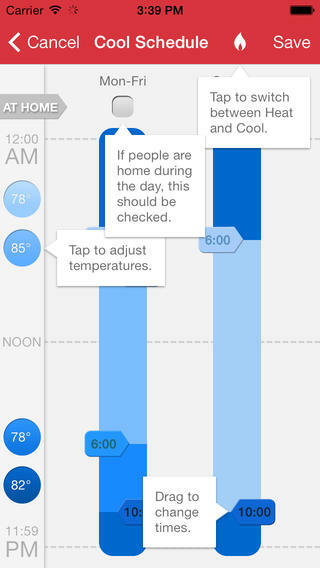 The Radio Thermostat Company app received a fresh update. 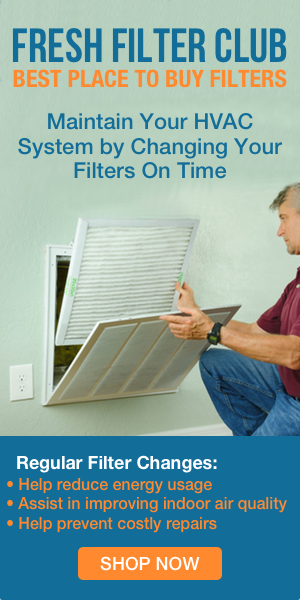 It provides a great schedule view for easily making changes for both heating and cooling schedules for each day of the week. If you have multiple locations, they can all be monitored and accessed from the app. Upstairs, downstairs, vacation home or even the grandparents house. It provides a since of security knowing money isn’t being wasted. 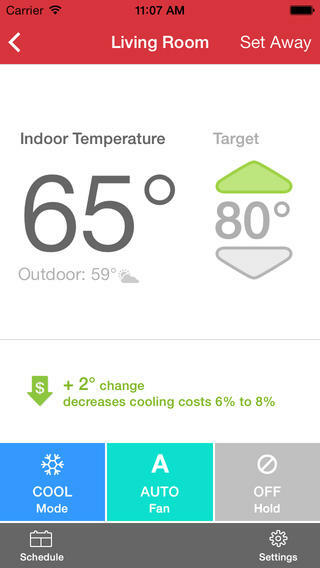 When temperature adjustments are made to the wifi thermostat using the app, a savings tip will be displayed such as a 6-8% increase in savings if the temperature remained at the pervious setting. Outdoor weather conditions are also display for quick reference. On a hot summer day you might want to set the temperature a couple degrees hotter inside so the air conditioning system is not constantly running.